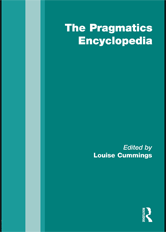 This encyclopedia covers the growing area of pragmatics: the analysis of language in context. It seeks to re-establish the identity of pragmatics, by focussing on what is at the core of the discipline. However, the encyclopedia also demonstrates how pragmatics interacts with neighbouring disciplines and so has a multidisciplinary outlook. It aims to both reflect the field and help shape the future of the discipline.